Last weekend I shifted position a little, turning from game jammer into jam co-organiser. Myself, Inger Ekman and Jon Back* arranged our local satellite of the global SETI-Jam – in which astronomers and game developers collaborated using real astronomical data. Our theme was simultaneously broad and fascinating, in that we had to address Frank Drake’s equation, for the likelihood of there being extra-terrestrial intelligence elsewhere in the universe. Ours was only one of two sites outside of the USA (and only three outside of California), but nevertheless we had visiting expertise from Stockholm’s local SETI academics. These astronomers and researchers were a huge help to us when it came to interpreting the SETI data – of which there was a great deal! – and to putting this search into context. Astronomer Prof. Erik Zackrisson talks us through the SETI program, and the work done locally in Sweden. Like most game jams and hackathons which are based on real data, more time than usual was given over to idea creation and team-forming. Ours was also a relatively small jam at 7 dedicated participants, so we ended up with some very fluid working practices. We followed Roger von Oech’s 4-step program of exploring the data, applying artistic ideas, judging those ideas’ merits, and finally seeing the task through. This did create some friction – game jams (and therefore jammers) are usually somewhat chaotic given the time limit, and so it can be hard to apply solid frameworks. In the end though, we arrived at two surprisingly similar but straightforward ideas with which to progress. SETI-Jam Stockholm in full flow. From left, clockwise: Stefan Andersson, Adrina Wennström, Hannes Delbeke, [scientists Saghar Asadi, Hannes Jensen & Per Calissendorff], Max Nilsson, Johann Prell and Inger Ekman. My own sub-team, which included an artist and two coders, worked on The Space Herring† – a relaxed puzzle game for touch-screen devices in which the player must send relay probes to the centre of each galaxy they encounter, from a point somewhere on its rim. To do this they must observe the blinking of each star which lays within range of their finite stock of probes. Contact a solar system which harbours intelligent life and you can build a probe to replace the one you sent; fail and you must re-evaluate your search. The game was based upon actual Kepler data – that being the data NASA collects on subtle variations in stellar brightness. Stars will tend to dim if an object passes in front of them, and both NASA and SETI can use this data to help identify extraterrestrial planets. By scrutinising such solar systems further we can theorise as to the conditions of such planets, and so with a little ludic license, we task our players with identifying possible sources of intelligent life. The other sub-team, formed of two coders and a composer, worked on Astrum – a gorgeous, audio-visual game about managing resources and linking paths between solar systems. The player navigates a 3D space in order to link up stars of varying magnitudes, with data pulled from NASA and SETI databases. The brightest stars will turn supernova much sooner than the others, and so the player must form their paths carefully in order to avoid breaking their network. Alongside both of these works (which were submitted to the ‘main’ SETI-Jam), Inger Ekman ran a couple of sessions for children – getting them involved in the act of making space-themed games. Most worked on Rymdraketbanana – a shooter of sorts, made in Scratch and controlled using actual bananas wired into a MakeyMakey deck. Players would take control of either the rockets or their communications arrays, ideally coordinating their efforts in order to avoid collisions with an asteroid and successfully beam messages at each other. Bananas, a MakeyMakey and a browser pointed at Scratch; all one needs to make “Rymdraketbanana”! This ‘mini-jam’ was an overwhelming success, and even saw some children expanding upon the example game in order to make works of their own. It’s our hope that we can hold more jams like this in future – where we encourage a diverse range of participants and include young people where possible. We had fun making the games, as at any game jam – but it always feels that bit more valuable when one applies real science, connects with local institutions and perhaps even inspires those who are in a position to start game development. Thanks to my Rymdströmming team-mates: Adrina, Max and Hannes! 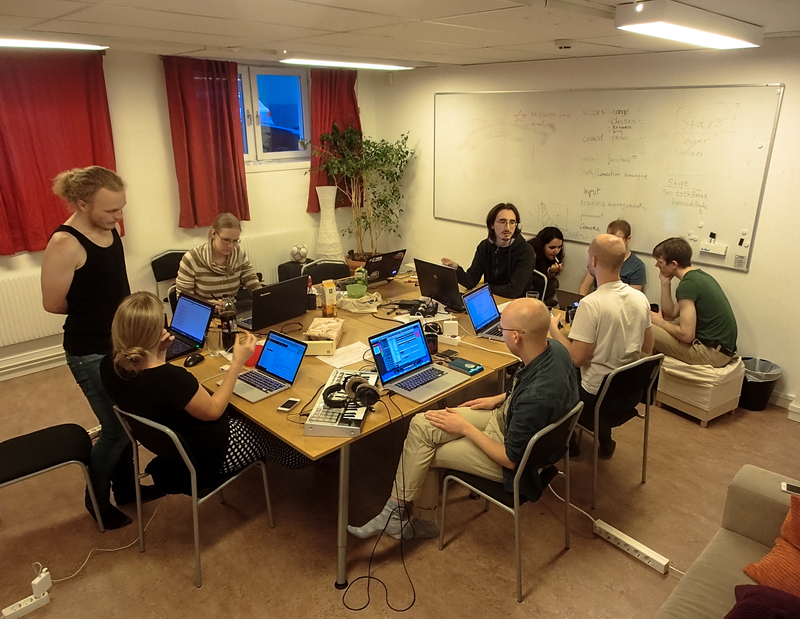 * This game jam also marked the debut of our new förening (society/association), Game Jam Stockholm – dedicated to hosting diverse and inclusive game jams in the area. † The name has no bearing at all on the game; it just arose naturally in conversation and ultimately gave us the opportunity to call our team something as daft as “Rymdströmming”.